One of the easiest and most common options for restoring well pad sites and pipelines is to restore them to herbaceous or nonwoody cover. Herbaceous cover can provide immediate erosion control as well as feeding sites for species such as white-tailed deer (Odocoileus virginianus), wild turkey (Meleagris gallopavo), and ruffed grouse (Bonasa umbellus) (Table 1). Herbaceous openings are sometimes planted with the same forages used in agriculture, but instead of being harvested, the plants are left for consumption by wildlife. A properly prepared herbaceous opening can provide high-quality, nutritious food for wildlife. Many different plants can be planted to benefit various species throughout the year, including several nongame birds and small mammals. Because of their use by many game species, herbaceous openings are often known as “wildlife openings." Reclaiming areas to herbaceous openings can provide food and cover for edge and open-habitat species and serve to attract or concentrate species that are typically rare or absent within extensive blocks of forest habitat. Herbaceous openings are most commonly planted for white-tailed deer, but can also be planted to benefit wild turkey, ruffed grouse, cottontail rabbits (Sylvilagus floridanus), mourning doves (Zenaida macroura), and songbird species associated with open or edge habitat. Voles (Microtus spp.) and rabbits use openings year round, and predators such as the red fox (Vulpes vulpes) feed on these small mammals. White-tailed deer forage on the herbaceous plants in the openings and use tall, thick, herbaceous vegetation as fawning cover. Wild turkey, ruffed grouse, and other birds use herbaceous openings for food and cover. Legumes planted in herbaceous openings stay succulent through most of the year and provide a winter food source when few alternative food sources are available. Disturbed areas planted with herbaceous cover can also provide a high abundance of arthropods, an important protein-rich food source for ruffed grouse poults (young). Ruffed grouse broods often use the edges of managed herbaceous openings, particularly ones with moderate forb (a nonwoody flowering plant other than a grass) cover and shrubs. These provide invertebrate prey and cover, but are open enough to enable poults to move freely. Herbaceous vegetation is also an essential part of wild turkey brood habitat because it supports a higher abundance of invertebrates than forested areas. Many nongame species, such as American goldfinches (Spinus tristus), chipping sparrows (Spizella passerine), song sparrows (Melospiza melodia), and several other edge and open-habitat species, also use herbaceous openings. During the nesting season in western Massachusetts, song sparrows, gray catbirds (Dumetella carolinensis), white-throated sparrows (Zonotrichia albicollis), and blue-winged warblers (Vermivora pinus) used wildlife openings that had high coverage of forbs, ferns, and grasses. The golden-winged warbler (Vermivora chrysoptera) is a species of high conservation concern that is found in early successional habitats (e.g., areas with grasses, forbs, and other nonwoody plants) in parts of Pennsylvania and might potentially use reclaimed pad sites and pipelines, depending on the vegetation within the opening and in the surrounding habitat. In the southern Appalachian mountains, golden-winged warblers utilized herbaceous areas located within clear-cuts. Reclaiming disturbed areas to herbaceous cover adjacent to other early successional habitats may provide nesting habitat for golden-winged warblers. Though the impact of herbaceous openings on small mammals is less well known, some studies have shown that some species are attracted to areas of herbaceous cover. In Pennsylvania, meadow voles (Microtus pennsylvanicus) and meadow jumping mice (Zapus hudsonius) were found only in or on the edge of food plots and not in the adjacent forest. In western North Carolina, the relative abundances of masked shrews (Sorex cinereus) and red-backed voles (Clethrionomys gapperi) were highest along a wildlife opening/forest edge. A study of winter oat (Avena sativa) food plots in Texas found that more than 50 percent of the forage was being consumed by rodents and lagomorphs (rabbits and their relatives). Wildlife species differ in their habitat requirements, and a habitat type that benefits one group may be avoided by or have a negative effect on another. Species that are forest specialists and forage and nest primarily within closed canopy forest habitat will generally not benefit from reclamation to herbaceous openings, and in many cases these openings will continue to be nonhabitat for them. This group includes many of our Neotropical migrant songbirds, such as ovenbirds (Seiurus aurocapilla) and black-throated blue warblers (Dendroica caerulescens), forest-dwelling salamanders, and mammals such as flying squirrels (Glaucomys spp.). These species benefit most from reclamation designed to return much of the well pad site to forest habitat and to shrink the width of pipelines and corridors. Restoration to forest cover will also more quickly reduce negative effects of forest fragmentation. See the pages on reclamation to shrubs and forests for additional information on habitat enhancement for forest specialists. a Gestation habitat can be created in herbaceous openings by using larger rock slabs that were unearthed during excavation. bFor golden-winged warblers and some species of raptors, surrounding habitat type and/or size of the opening will determine whether the species is present. A solid reclamation plan needs to be in place before construction even begins. Take photos of the proposed site prior to any disturbance and test soil samples. This will help establish baseline values for comparing with postconstruction levels. Consider the ecology of the site area and identify plant communities native to the site. Create a reclamation schedule that allows for seeding before mid-April or after mid-September. This will allow the greatest chance of adequate germination. No permanent seeding should be conducted between June 30 and August 31. As a first step in reclamation, remove and reuse or dispose of the rock surface or any other fill materials covering the pad. The pad should be contoured back to the original slope, blending in with the surrounding area. Subsurface backfill can be replaced using standard practices. For surface materials, use low-compaction grading methods to minimize soil compaction. Smooth surfaces are not necessary and do not contribute to reclamation success. Using a dozer to cover the land with track and cleat marks – also known as “walking in or “tracking in” – should be avoided because it hinders vegetation success. Topsoil that was set aside and stored during the construction process should be respread over the entire site, also using low-compaction methods. To improve stability, only the top 4–6 feet of soil should remain loose and uncompacted. On areas where stability is not problematic, plow or rip the subsoil prior to replacing the topsoil. To reduce compaction, final grading should occur only when surface materials are dry. To keep from compacting soils during the grading process, use the lightest equipment possible and the fewest passes possible. Do not use equipment with rubber tires; instead use tracked equipment that causes less compaction. On steep slopes where backfill is needed, unload the backfill materials from the uphill side of the pad. If the soil does not need to be compacted, use a light dozer to shape the site to the original form, but do not smooth or track the surface. All grading should be done moving downslope and all upslope tramming should be limited to roads or a tramway. The dozer operator should not track up non-tramway areas that have already been reshaped. If the backfill does require compaction for stability, use normal practices to construct a stable backfill. Then cover the compacted backfill with 4–6 feet of uncompacted soil using light downslope grading as described above. Conduct soil tests to compare current conditions to the soil characteristics of the site before disturbance occurred. If needed, apply fertilizer and lime at rates suggested by the soil test. When restoring pipelines, avoid using fertilizers and lime between the last slope break and stream banks. On gentler slopes with more space, avoid application within 250 feet of a stream. Lime should be applied and incorporated into the soil 2–4 weeks before seeding. Incorporate the lime at least 6 inches into the soil before revegetation. The amount of fertilizer needed depends on the soil characteristics and the vegetation being planted. There are many different options available when selecting herbaceous species. Species selection should be based on climate, site conditions, species growth habits, and landowner goals. Wildlife may use an herbaceous plant by eating the leaves, stems, or seeds of the plant. Some herbaceous plants benefit a certain wildlife species or group of species, while others are very broadly used. For example, wheat (Triticum aestivum) and clover (Trifolium spp.) are both popular herbaceous species that are used by multiple game and nongame species for both forage and seed production (Table 2, below). Adding species such as buckwheat (Fagopyrum esculentum), partridge pea (Cassia fasciculata), and sunflower (Helianthus annuus) to standard seed mixes can increase the amount and diversity of food sources available for wildlife. Insects associated with herbaceous openings provide a food source for many wildlife species, and their abundance is influenced by the type of vegetation in the opening. For example, in one study, logging roads planted in clover yielded greater numbers and biomass of insects than roads planted in orchard grass (Dactylis glomerata). In Texas, planting multiple species of millet and peas in a food plot increased the abundance of invertebrates, and the abundance of invertebrates was greater in cultivated plots than in the native vegetation. Wheat is a commonly planted species that can support high populations of invertebrates, especially when weeds are allowed to grow amongst the unharvested wheat. The best way to provide a variety of food sources in an herbaceous opening is to use a seed mixture that contains several different herbaceous species. Seed mixture packages list the seeding rate (usually pounds/acre). Many different seed mixtures have been planted successfully on surface mines, log landings, and food plots. Several of the mixtures can also be used to reclaim well pads, pipelines, or other disturbed areas. Please see the section on seed sources for a list of suggested seed mixtures. Several commercial seed blends are commonly available. Though many of the commercial blends can be successful, caution should be exercised with these blends. All commercial blends should come with a seed tag that lists the proportions of the different species in the mixture. Do not use blends that do not have a seed tag. Check the seed tag to see if the species in the mixture are adapted for the region and conditions of the reclamation site. In addition, make sure there are no unwanted or potentially invasive species included in the mixture, that the species are beneficial for wildlife, and that the functions of the species are compatible with landowner objectives. To maximize habitat productivity and diversity, a mixture of forbs, grasses, shrubs, and small trees should all be established on restored areas. This will create a habitat mosaic that will provide multiple sources of food and cover. Good seed to soil contact is the key to a successful planting. There are several steps to take to ensure good contact. If planting in existing vegetation or on compacted soils, mechanical preparation of a seedbed is needed. Use farm implements such as harrows, disks, and chisel plows to loosen the top 3–4 inches of soil. Tillage is typically not needed if the site is seeded immediately after grading. Use appropriate equipment, such as a cultipacker, to provide a firm seedbed on which the seed will be planted. After site preparation, the next step is to plant the seed. There are three different standard methods of seeding: drilling, broadcasting, and hydroseeding. Using a grain drill with a cultipacker is the preferred method of application. A grain drill also eliminates the need for seedbed preparation. A drill will place all of the seed to a selected desired depth. Less seed is required because most are planted in a microenvironment that favors germination. Where seed is broadcast, firm the seedbed with a cultipacker after seeding. In rocky areas or other areas where the effectiveness of a cultipacker is limited, other equipment (e.g., a chain drag) may be used to lightly cover seed after application. Another popular seeding method is hydroseeding, which involves combining the mixture of seed, fertilizer, lime, and mulch into a slurry that is then sprayed over the reclaimed area. Before hydroseeding, scarify the seedbed to facilitate lodging and germination of seed. Scarifying involves loosening the soil to improve seed-to-soil contact. It can be done by pulling something such as a disk or rake across the site prior to hydroseeding. No matter which method is selected, remember that a patchy distribution of seeds is often more beneficial for wildlife than thick homogeneous cover. The recommended seeding rate is provided on the package for most mixtures. The amount of seed used in a mixture depends on the germination rate of the seed. Planting by broadcasting or hydroseeding will require twice as much seed as a grain drill. Know if the recommended seeding rates are for broadcast or a grain drill and adjust the seeding rates to match the planting method. If a seed rate is recommended for a grain drill and hydroseeding is the planned planting method, the seeding rate should be doubled. If a seeding rate is for broadcasting and a grain drill will be used to plant, cut the seeding rate in half. Note that many seeding rates are given to produce a dense cover of vegetation, and this is not always best for wildlife. Both turkey and grouse require open, patchy areas so that they can move around freely. See sections on managing for individual wildlife species for more guidelines on preferred densities of vegetation. Immediately after seeding, mulch should be distributed on the site to protect the seeds and the soil. Mulching will protect the seeds from wildlife, protect the soil from erosion, and retain soil moisture. Spreading mulch over the site will help prevent erosion until vegetation takes hold. To prevent the spread of invasive species, use certified weed-free mulch and straw instead of hay whenever possible. Planting legumes in herbaceous openings can be beneficial for both the soil of the restored area and the wildlife that use the site. Legumes can fix atmospheric nitrogen into the soil. This increases the amount of soil nitrogen and reduces the need for fertilizer. Many legumes are also high in protein, which is important for the production of nutrient-rich milk, as well as bone and antler growth. Examples of legumes used in herbaceous openings include clovers, partridge pea, and soybeans (Glycine max). Legumes should be inoculated with Rhizobia bacteria before planting to improve their nitrogen-fixing capabilities. When inoculating seed, two conditions must be satisfied to get good nodulation: (1) the roots must be in contact with the Rhizobia bacteria, and (2) the Rhizobia must be alive and able to infect the plant root. Inoculate legumes immediately before sowing with an inoculant specific to the species using the manufacturer's recommended rate of inoculant appropriate for the seeding method (broadcast, drill, or hydroseeding). If hydroseeding, there is a risk that the low pH of the slurry will kill the inoculant. If hydroseeding will be the method of application, the pH of the slurry should stay around 5.0 and application should occur as soon after mixing as possible. Summer annual legumes, such as cowpeas (Vigna unguiculata) and soybeans, can be sown in late spring or early summer to provide food patches and quick cover. Cool-season legumes such as clover are best planted in the spring. Legumes sown in the fall sometimes fail to establish because the seedlings are winter-killed. After ensuring that erosion control measures are in place, one might choose to let other plants move in on their own. In several cases, the plants that naturally colonize a disturbed area may be more beneficial than the species actually planted during reclamation. Allowing native herbaceous plants to colonize a reclaimed area can improve the diversity of the reclaimed area, as well as reduce planting costs. After disturbance, surrounding species begin to colonize the area through seed dispersal or germination of seed that is stored in the soil. Through the process of succession, disturbed habitats are colonized by fast growing “pioneer” species. Native pioneer species such as ragweed (Ambrosia artemisiifolia) can provide forage for white-tailed deer and seeds for American goldfinch (Carduelis tristis), mourning dove, dark-eyed junco (Junco hyemalis), and several species of sparrows. Though pioneer species can quickly become established, they are short-lived annuals and are eventually replaced by perennial forbs and grasses. Wildflowers are also common pioneer species, providing pollinator habitat for various species of butterflies. Indian hemp is one such colonizing species that butterflies commonly use. Herbaceous openings with some native plants can mimic an old agricultural field reverting back to the natural habitat. These “old fields” are very important for several bird species and also provide food and cover for small and large mammals. Research shows that recently retired agricultural fields that consisted of bare ground and forbs had greater avian abundance and diversity than older fields established in grasses. Meadow voles, which are an important food source for several birds of prey, commonly inhabit old field habitats. On a reclaimed surface mine, eastern cottontail rabbits were significantly correlated with naturally invading species such as blackberry, Queen Anne’s lace (Daucus carota), Pennsylvania smartweed (Polygonum pennsylvanicum), yarrow (Achillea millefolium), and beggar’s tick (Bidens vulgata). Wild turkeys are commonly associated with species such as wood-sorrel (Oxalis europaea), sedge seeds (Carex spp. ), deertongue (Panicum clandistinum), and blackberry (Rubus spp.) that commonly become established as succession occurs. Depending on the size of the opening and the type of vegetation that occurs on the site, golden-winged warblers may also use these fields. Areas restored to herbaceous openings can be either permanent or temporary. A permanent herbaceous opening requires active management, such as herbicide application, mowing, disking, or replanting. 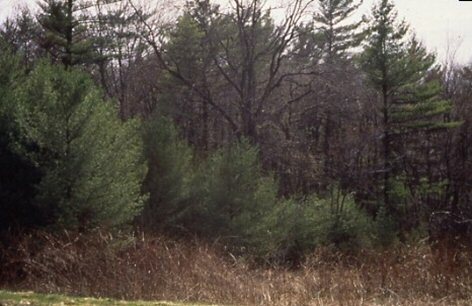 If not managed, woody species will begin to invade the herbaceous opening, and as succession occurs the opening will eventually become similar to the surrounding forest. Succession can be halted through various types of disturbance. A selective herbicide can be used to remove individual exotic, woody, or otherwise unwanted plants. Standard herbicide methods include using a tractor-mounted spray gun or a backpack sprayer. Herbicides are very effective, but can be very expensive, and knowledge of herbicide safety and handling (and, for some herbicides, licensing) is required before their application. Herbicides may reduce invertebrate populations that are important food sources for birds. In addition, precautions most be taken to protect nearby water sources, including streams, vernal pools, spring seeps, and wetlands. Mowing can be used to set back succession and promote new growth. Mowing kills or slows the growth of woody species and some forbs and promotes the growth of grass. Therefore, the frequency of mowing should be limited to allow for a diversity of forbs, grasses, and some shrubs. When mowing, do not clear the entire site all at once. Instead, mow in a random mosaic pattern, or break the field into sections that will be mowed in a rotation. This will create a flush of new growth in the mowed areas, while retaining existing food and cover in the unmowed portions. The timing of mowing is also important. Mowing during the spring and summer will destroy nesting habitat and may destroy the nest itself if birds are nesting within the opening. For this reason, mowing should not occur between April 15 and August 1. Delaying mowing until early to late fall is even better because the flowering plants present in late summer and fall are an important source of nectar for butterflies and many birds use the seed heads. Because of the presence of rocks, limbs, or woody debris, mowing should be done with a bush hog. Minimum mower deck height should be 4-6 inches, or greater than 6 inches if warm-season grasses are present. Mowing should occur every 2-5 years, depending on the wildlife species desired and the growth of the vegetation. This mowing schedule should be adequate for maintaining grass and forb cover and limiting colonization by woody species while at the same time minimizing disturbance to wildlife. Disking the herbaceous opening can control woody invasion, improve the diversity of herbaceous plants, and stimulate the growth of new plants. Compared to mowing, which promotes grasses, disking stimulates the soil and seed bank, promoting the growth of both grasses and forbs. Disking should be done in the fall, because the exposed roots of woody trees will be winter-killed. Disking strips should meander through the area and can be located adjacent to protective shelter. Similar to mowing, disk in a rotation, alternating the disking areas to retain existing food and cover. Herbaceous openings should be monitored on a regular basis to ensure that invasive species are not becoming established on the site. If they do become established, measures should be taken to eradicate them before they become a problem. Brenner, F. J, R. B. Kelly, and J. Kelly. 1982. Mammalian community characteristics on surface mine lands in Pennsylvania. Environmental Management 6: 241–249. Donalty, S., S. E. Henke, and C. L. Kerr. 2003. Use of winter food plots by nongame wildlife species. Wildlife Society Bulletin 31: 774–778. Healy, W. H., and E. S. Nenno. 1983. Minimum maintenance versus intensive management of clearing for wild turkey. Wildlife Society Bulletin 11: 113–120. Keller, G. S., and R. H. Yahner. 2002. Butterfly communities in two Pennsylvania national parks. Northeastern Naturalist 9: 235–242. Pennsylvania Game Commission and Pennsylvania Fish and Boat Commission. 2005. Pennsylvania comprehensive wildlife conservation strategy. http://fishandboat.com/promo/grants/swg/nongame_plan/pa_wap_complete.pdf. Rafaill, B. L., and W. G. Vogel. 1978. A guide for vegetating surface-mined lands for wildlife in eastern Kentucky and West Virginia. USDA Forest Service, Northeastern Forest Experiment Station. Berea, KY.
Taylor, R. L, B. D. Maxwell, and R. J. Boik. 2006. Indirect effects of herbicides on bird food resources and beneficial arthropods. Agriculture, Ecosystems, and Environment: 116: 157–164. U.S. Fish and Wildlife Service. 2009. Arkansas best management practices for natural gas pipeline construction and maintenance activities in the Fayetteville Shale area, upper Little Red River watershed. U.S. Fish and Wildlife Service, Arkansas Ecological Services Field Office, Conway, AR.